Hi all! I am trying to track down Abigail Spitler. She is one of the winner’s of Day 3′s Pacific Natural Foods giveaway. Abigail, if you’re reading this, check your spam folder for two emails from me or email me back here. Healing Cuisine hosting Day 5′s giveaway! I would like to give away bundles of my five e-cookbooks full of 107 exclusive recipes not found on my blog. And, bonus, I’d like to give these away to FIVE of you! It’s the 5-5-5 deal. Day 5, 5 e-books, 5 winners! Full of 62 Advanced and Core Plan recipes, including all of my favorite Christmas cookie recipes. Have a romantic night in with your loved one and stick to your whole food lifestyle. A sweet and savory spin on Easter brunch! Treat mom to a full spread of delicious and colorful Advanced Plan foods! Full of an easy-to-make whole food menu of recipes kids will actually eat and love! Find the lists of exact recipes here and here. With Christmas around the corner, I encourage you to check out my Season’s Eatings holiday e-cookbook for all your menu planning needs. To download it or any of the other e-books, check out the e-Book Menu Planners page. There will be 5 WINNERS for this giveaway!!! 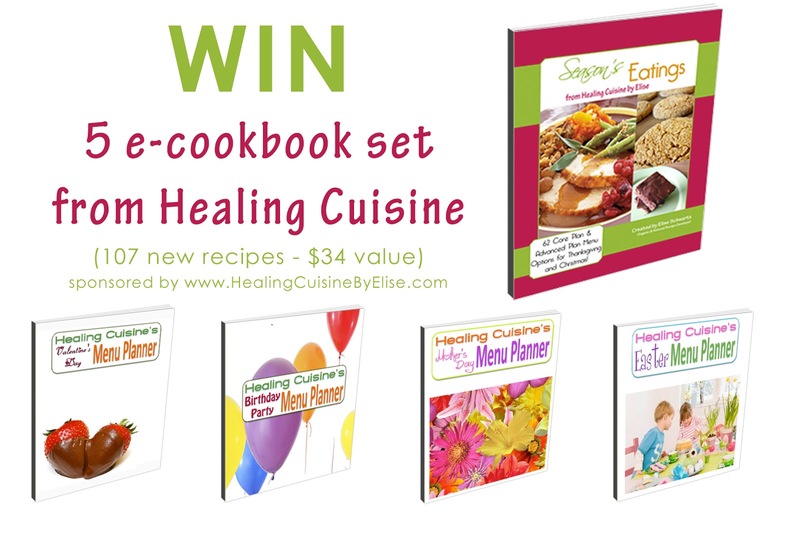 Enter to win a 5 pack bundle of Healing Cuisine’s e-cookbooks! This giveaway will last 24 hours, from midnight EST on Tuesday December 4th until 11:59pm EST the same day. Entering is easy! Simply follow the various options below in the Rafflecopter widget window. This Healing Cuisine brand giveaway is open worldwide. There will be five winners. The winners will be contacted and confirmed within 48 hours after the giveaway ends. All entries are verified via Rafflecopter. I am most excited to try the menu planner; that is Always A CHALLENGE to plan making food when you work!! THANKS!! !